The tube is called Sugarplum Maria. Resize paper 13 to 23%, apply mask 105 first, delete and merge group. Paste the paper again resized like before, apply the other mask, delete, merge group. Resize the corner element to 50%, place on one side, duplicate, mirror, merge down. Paste element WOA at the bottom, resize to 80%, apply EyeCandy 4000-Gradient glow on the fat setting and color white, width at 3. Paste your tube on the mask layer how you like, then take your free hand tool, draw around the frame part, invert, delete. Paste your tube again, resize to 30%, paste on the right below the wordart layer. Paste Balls 5 element below the tube layer on one side, duplicate, mirror. 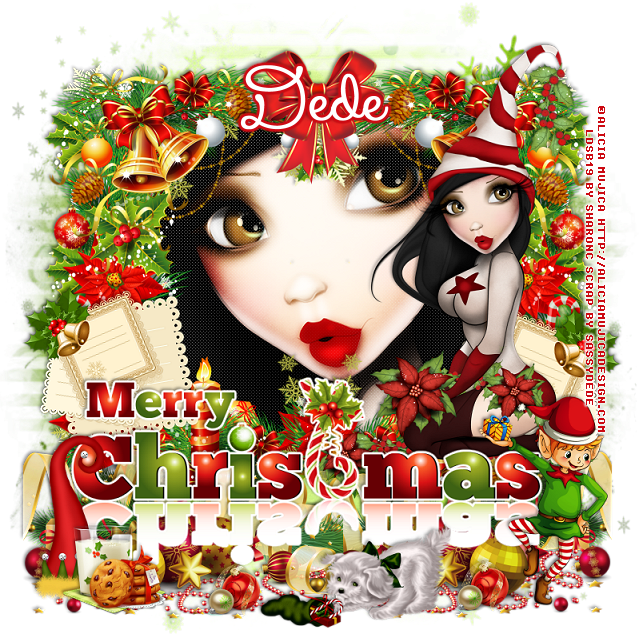 Resize the elf to 25%, mirror, place on the right side above the wordart. Resize dog 2 to 30%, place in front of the wordart where you like. Resize element Balls 16 to 30%, place by the dog, duplicate and move over by the elf. Resize food 6 to 50%, place on the left side. Resize the elf hat to 25%, place below the food layer and over just a bit. Resize ribbon 3 to 25%, place at the top on the frame. Resize tag 2 element to 25%, place on the left below the wordart, duplicate, mirror, move below the tube and down some.